When one of my readers condemned me to hell for a True story, it occurred to me that if she could send me to hell with the snap of her mind, why shouldn’t I have the power to counteract her evil intentions? I should indeed, and the reaction from readers has been incredible: thousands and thousands and thousands of the cards have gone out, and they’re being passed around in every U.S. state, most Canadian provinces, Australia, Austria, Belgium, Bermuda, Croatia, England, Denmark, Finland, France, Germany, Iraq, Ireland, Israel, Japan, the Netherlands, New Zealand, Russia, Scotland, Spain, Sweden, Switzerland, South Korea and Taiwan. You can get some for your family and friends too! Where did the idea for the cards come from? Several years ago, I was talking with Cathie Walker, creator of the now-defunct Centre for the Easily Amused site, when she mentioned a new evil scheme she was working on. Oh my: what an idea! I immediately set out to design a real one to save her soul. Those were never made available to the public, however. So when one of my readers condemned me to hell almost exactly two years later, it was updated to make a comment — and counteract the new threat. When they were offered to readers, they went wild for them. Unlike in the board game, money can’t buy you out of hell. 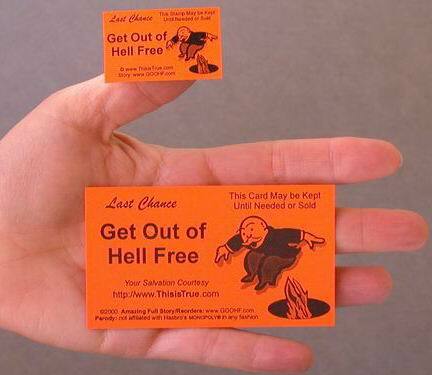 The “Get Out of Hell Free” card’s intent is to mock the triviality of the MONOPOLY® “Get Out of Jail Free” card — just as in the board game, if you’re in big trouble (and, according to certain humorless readers, the ultimate in “trouble” for me is hell! ), you just slap down a card and waltz merrily away, leaving your opponent befuddled. Obviously, no one thinks an orange parody card will really keep them from going to hell, should that be part of their beliefs, but people do get the joke: no matter whether your trouble is being sent to a board-game jail or hypocrites are telling you you’re going to hell for your “moral bankruptcy” (i.e., not believing the exact same thing they do), having the right card will set you free. GOOHF cards, stickers, and other related items are available through our shopping cart. There’s also a separate Get Out of Hell Free web site with more info, stories, and other fun stuff. 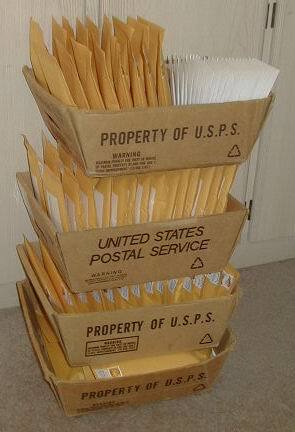 This mailing is just one weekend’s worth of orders — about 3,500 cards going as far out as Australia. As many as 12,000 cards have been mailed out in just one week. See? Even people who deal with fire every day need this extra protection. Don’t go thinking you can handle it on your own. If you’re not convinced, read the next one. All I know is, you have to have a subscription to This is True for it to work. If you don’t have one already, enter your email address in the spot on this page. But you’ll have to talk to your pastor, Sarah, to get the other details. And if you don’t like his answer, try a different denomination. I hear Rev. Billy welcomes visitors at his church in Texas. Well, I was going to berate you for how cheap you are with your gifts, but then I realized: you just can’t put a price on someone’s salvation. It would be interesting to see the look on your grandma’s face when you hand her a card, telling her you got it to her Just In the Nick of Time. Man: that’s more coercive than some churches! And since the cards can be reused, your boss can pass it along to his boss next week. I promise to send you $2 for cards ASAP — heck, I’ll send $10 for two — if you will PLEASE SEND THE CARDS NOW: one for me, and one for my husband. (He is being held in the same jail [as I am].) –Theresa, Inmate 558261, California. The whole story on my being condemned to hell. Includes the original story and reader reaction. Again, The “Get Out of Hell Free” products are not affiliated with, nor authorized, endorsed or licensed in any way, by Hasbro Corp, its affiliates or subsidiaries. It is a parody. Hasbro objected anyway! But our lawyers scared them away.